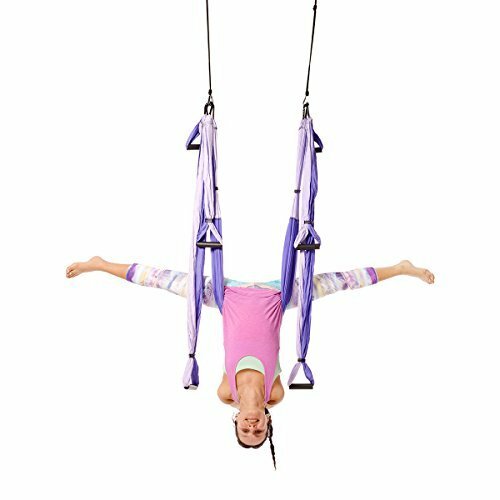 In this article we are reviewing the equipment needed to practice Arial Yoga and the best yoga swings on the market ,Never heard of it? Well its yoga but on a whole new level and I mean that literally. Think yoga poses while floating in the air while fabric holds you up. Too difficult? Don’t let the challenge put you off. Aerial yoga is aimed to accommodate all kinds of people. This innovative type of Yoga was started in New York by Christopher Harrison. It doesn’t matter what your body type or fitness level is. You will find safe exercises ranging from slow controlled movements going into more advanced routines. And if you’ve never tried out yoga before you will absolutely enjoy the tranquilizing effect some of the poses will have on your body. Carving out a space of time to restore your body is a necessity in our busy lifestyles. So, take time out and give your body the treatment it deserves. Let us help you find the product which will best suit your needs. Finding the right equipment can be a challenge. The idea of an aerial yoga swing originated as an add-on product for a yoga self-help manual. It was designed for those who enjoy exercising in the privacy of their homes without instructors. It’s made from a nylon fabric which is also used for parachutes. It has a silk like smoothness which slows down the motion of your body through the atmosphere. You will find the fabric is remarkably tough and quite resistant to tearing or ripping. This is because extra threading is used in nylon to make a solid pattern of tiny squares. So if a tear does happen it won’t become bigger because the square pattern will keep it contained. This is why you can feel absolutely safe floating above the ground. The aerial yoga swing has handgrips. This will help you with muscle extending and firming workouts and even inversions for when you feel brave. The handles are handy for getting in and out of the swing and to lift yourself upwards without any assistance. They also offer great support for moving comfortably in and out of poses. Below is video to help you understand the basics. An Aerial Hammock is a central part to the aerial yoga concept. It was created to be used in conjunction with the aid of a qualified yoga instructor. The hammock works as a swaying mechanism which offers protection for your hips as you move into different positions above ground. As you attempt a forward bend or a back bend, the hammock will help to reduce the strain on your body. An aerial yoga hammock will also bring diversity to your workout routine. Positions which seemed previously impossible on a yoga mat are now attainable trying it above the ground. An Aerial Yoga Hammock is made from an artificial fabric with a slick and lustrous texture so it won’t cause any irritation to your skin. In fact you’ll love the elegant feeling against your skin while working out. Artificial fabric is often reinforced with organic and inorganic ingredients making it exceptionally strong and trustworthy for aerial yoga movements. The hammock is hung from the ceiling and will run almost to the floor. This excess fabric is to provide you with plenty of room to play around. While you’re hanging up in the air, you’re able to adjust poses making them easier or difficult according to your preferences. You will find the hammock material is quite versatile and flexible to help with natural spine traction giving you maximum muscle health and extension. Because they’re lightweight and easy to install these are great to take on vacation so you can keep on doing your sessions. You could invest in an Aerial Yoga Stand. It has a solid metal frame ensuring utmost safety as you move in and out of poses. The stand can be quite bulky so finding space to set it up can be a challenge. But it only takes ten minutes to set up an aerial yoga stand so it’s possible to do it on the beach before a swim. The installing phase is what puts off a lot of people because they think there’s going to be a lot of work involved. Ironically aerial hammocks and swings are designed for easy set up especially since they can be mounted anywhere. A good place to start is to examine your home. Bear in mind your chosen spot should have a five feet distance around the entire unit to avoid accidentally crashing into anything and causing injury. If the beams are too thin they might not be sturdy enough to hold up weight of the aerial hammock or swing. An aerial yoga hammock is about just under 10 ft. long and 7 ft. wide. So it’s recommended your ceiling will need to be at least 9 ft. high. Another option for height set up is to measure your height and adding one extra foot. Also note if your ceiling is much higher you can always switch to extended ropes as long as the aerial hammock or swing is still able to reach down to your hip. The recommended ceiling hooks or lag nuts won’t always be provided with the product. Sometimes the recommended fasteners for the product won’t suit your ceiling beam structure. The best thing to do is to first examine your ceiling structure before buying mounting hardware. How you choose to mount up your aerial yoga swing or hammock will make a difference on how much mobility and freedom you will have in poses. If you choose to place it across a number of ceiling beams this might restrict your movement compared to putting it along the length of only one beam. If you’re in a rental home finding an option you could try out is a free standing pull up bar. They easily set up anywhere as long as you find the suitable size. If it can detach it has the benefit of not requiring screws but ensure it’s sturdy enough to hold you up. Here’s a tip: Your movements are restricted using only the length of a doorframe compared to a wider ceiling space or an Aerial Yoga stand. You may wonder if it’s actually possible to do regular yoga poses in the air. You’ll be surprised how this approach can actually enhance some poses. Put both your feet into the Aerial Yoga Swing or Hammock. Make sure your hands are on the floor directly under your shoulders. One reason why aerial yoga is such a craze at the moment is because it’s crammed full of health benefits. There isn’t enough clinical research done but many subjective stories point to the following as health paybacks from yoga poses and aerial yoga poses. As every part of your body is required to move and stretch your muscles will get naturally toned and redefined. In addition all joints are redeveloped and strengthened. Practicing aerial yoga gives your body more freedom of movement compared to yoga on a mat. You can now move your body into positions you haven’t tried before. This means deeper and more fulfilling stretches can happen as you’re able to hold poses for longer periods. This will increase your mobility and deepen your practice. We spend too much time sitting at a desk or in our cars and end up with back pain. Aerial yoga allows your body to hang freely allowing your spine column to extend naturally. This reduces pressure on it. Exercising in an aerial yoga swing or hammock places less strain on your back while exercising as it reduces the stress on the spinal cord and hip joint. As gravity works harder on your body it will cause your muscles to work tougher as well. You will be able to do deeper hip openers and greater back bender stretches. A consistent routine will strengthen every part of your body making your muscles stronger and less injury prone. The aerial yoga swing and hammock allow you greater freedom in movement and requiring less effort from you by counteracting gravity suspension in the air. This will place less tension on your bones and muscles compared to other forms of exercises like boot camp. You will need to engage your core muscles to balance and stabilize yourself in mid-air. This will require an intensive abdominal muscle workout. Building core strength will also increase spinal and shoulder flexibility. You will notice an improvement in your balance and stability in your everyday life as well. Aerial yoga helps to clears your mind and relieves stress. This also helps you deal with stress throughout the rest of the day. You might even notice changes in your blood pressure and cholesterol after practicing aerial yoga for some time. Aerial yoga can also enhance your creativity which can lead to an improvement in your artistic talent. Stretches and aerial yoga movements can also improve your digestive system by increasing your blood circulation. This helps with constipation and indigestion symptoms. Detoxifying your blood circulation system can give you a higher antioxidant level resulting in a tougher immune functionality. Your arms and legs become stronger from supporting your body above the ground. This enhanced strength gets used in other daily activities such as recovering faster as an athlete after a race. When you’re out shopping you need a checklist. Here’s what you need to know. Good quality fabric he more you invest the less you will have to worry about wear and tear issues. Weight limitation Look for something which is double your weight and able to be held up by carabineers. Set up procedure Does the product include everything needed for set up? Is there any mounting hardware included? Safety precautions One way to test it out is to ask yourself if you’re able to twist your body into a full back bend and hang upside down feeling secure rope connection with this product? A good swing should be comfortable and safe whether you’re lying horizontal, vertical or upside down. Portability Does the product come with a good quality bag to transport it? Otherwise the fabric might get damaged. 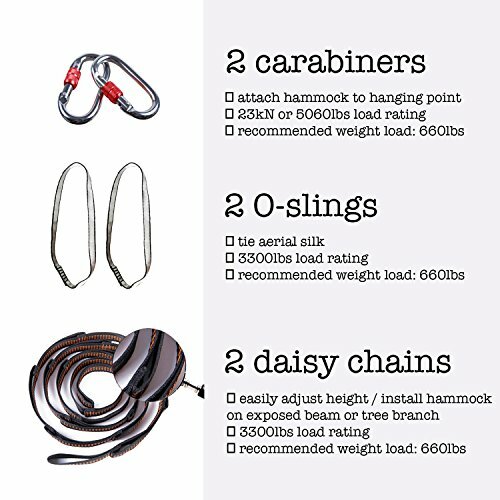 Adjustability Can the support chains or webbing straps be adjusted to accommodate your height requirements? When the aerial yoga hammock or swing is only lifted three feet above the ground the risk of injuring yourself is minimal. But there are some dangers involved if you aren’t prepared well. Warm up correctly before trying an inversion to prevent light headedness or motion sickness. Having lots of water and a light meal will also help. Wear comfortable clothing but not too loose fitting so it doesn’t interfere with the equipment. Check out this Complete Buyers Guide to the Best Yoga Pants. Note that slippery fabric will cause you to slide out of pose. Avoid wearing jewelry as this could create tears or holes in your fabric. It’s also wise to give this exercising a break after you’ve had surgery. But once you’re ready to start, which of these will you choose? This is a great product to use for back and core strengthening. Muscles around your spine can be strengthened and relaxed naturally by hanging freely upside down on a Yogabody Yoga Trapeze. It may feel more like playing than actually exercising since hanging on a Yogabody Yoga Trapeze feels like so much fun. Instructional videos are also available to guide you in how to use the hammock for a maximum workout. If finding time to exercise every day is a challenge this is a great way to do it right within the comfort of your home. This product also comes with an incredible 10-year parts guarantee. Visiting an aerial yoga studio can be a fun and dynamic experience. But attending regularly can become costly. Buying a trapeze for regular use could work out much more economical. This is a nice product to build deep core strength through inverted gravity resistance workouts. The fabric is a beautiful pink and grey. It’s a high quality parachute material which has been stress tested up to 600 lbs. This should leave you confident hanging up there. You will love how child friendly this trapeze is. It accommodates exercises which can be modified and varied to suit different levels. Kids could learn the benefits of having a healthy stretching routine from a young age. Doing yoga poses in the air stretches and strengthens your whole body. This yoga swing can help to improve your level of flexibility and build up strength in your upper arms and legs. Back bends can be attempted in a safe and easy manner by leaning backwards and grabbing your ankles. This is a great product to try out in the park on a nice summer’s day. You could even attach it to some monkey bars. Note that it requires patience to learn the exercises in the videos but basic poses are achievable. If you’re looking for a relaxing workout after a long hard day you will absolutely love this yoga swing. 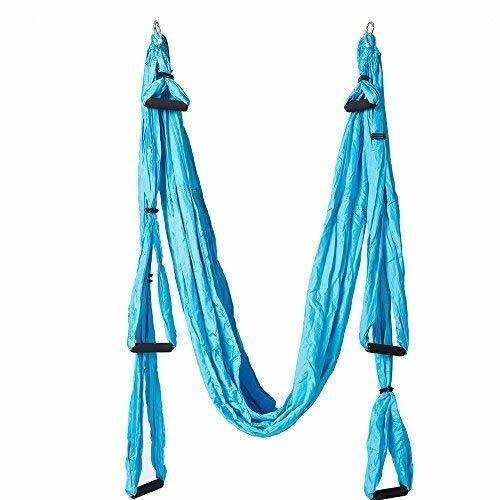 It provides a luxurious elegance and grace to your aerial yoga routine. The stretchy silk fabric can fit along your whole body giving you a feeling of impressive control during every pose. An installation video as well as an aerial yoga class is provided when you purchase this product. Start your training with some momentum. There are no handles on this one causing your muscles to become even more alert and engaged during workouts. Sit ups and leg lifts will feel easier on the hammock compared to using a yoga mat on the ground. This is a great product for pull ups and building up your wrist strength. Transitions from one pose to another will feel more achievable with this holding you up and you’ll even hold poses for much longer. An Aukiee Yoga Swing helps you take control of your family’s health. Kids might not even be aware they are exercising with this product in their home. This is the sneaky way to get your entire family exercising. It’s a very child-friendly swing hammock. It has large comfortable padded foam handles which will work for a small hand to comfortably hold on to. The swing seat is spacious and triple stitched ensuring a high degree of safety. Mounting accessories are also included with this product so you don’t need to spend extra money on hardware. This product will improve your back health significantly with the use of a Yoga Swing. Pain and stiffness can be reduced by giving your spinal column a chance to decompress and realign by hanging freely. A Premium Aerial Silk Yoga Swing is a stunning sheer fabric which conforms to your body contour. The width of fabric is so generous you can grip it as side handles during aerial yoga poses. This makes it a great product for beginners as well as trainers. It’s made from Tricot polyester fabric which feels luxurious on your skin as you transition in and out of poses. 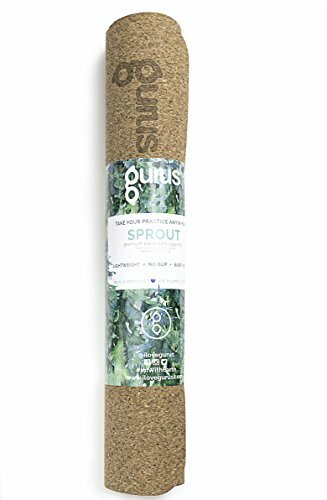 This product will help you improve your overall flexibility in all poses. You will notice significant improvement in your balance as you practice deep back bends and forward bends. Aerial yoga is good for your soul as well as your body. It builds you up internally and externally as you take time out to invest in yourself after a hard day. Are you ready to start doing this more? There are so many wonderful tools out there to help you accomplish this. What is our favorite? 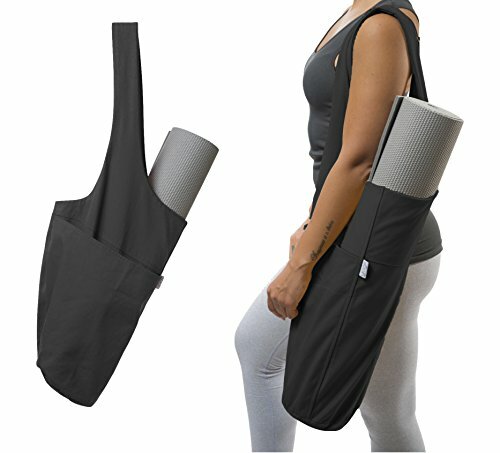 The Aukiee Yoga Swing Hammock Trapeze Sling is by far the winner. We love that you can pull on the handles and lean into a back lift and how you can also use it for a lotus position. Now go find out what pose you enjoy doing in your aerial yoga swing.